Downsizing. The modern day buzz. You hear it in coffee shops, see it on magazine covers, bump into it around each corner. But what does it really mean? How do you go about downsizing anyway? Well. I thought I knew. We decided now was the right time for this next step. I had a plan and thought it was good. My Mr. was on board with rolled up sleeves. We even got a jump on move out/move in crunch time by starting early. We donated, sold, and generally spread the wealth of our too-much-stuff around. In the early phase things were rolling along like a well oiled machine all in preparation for this snapshot of our downsized space. Not bad, right? Built-in storage – check. Modern kitchen, great outdoor living space – check, check. 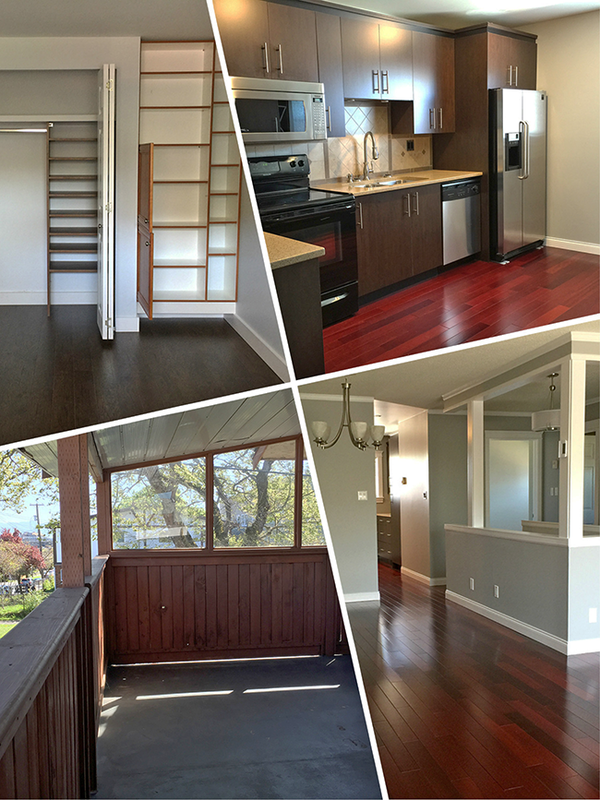 Open concept footprint – yes. We even managed to put some things away in the beginning of this process. Yes, I was feeling pretty swish. We’ve got this! I’m pretty sure that’s what we said. 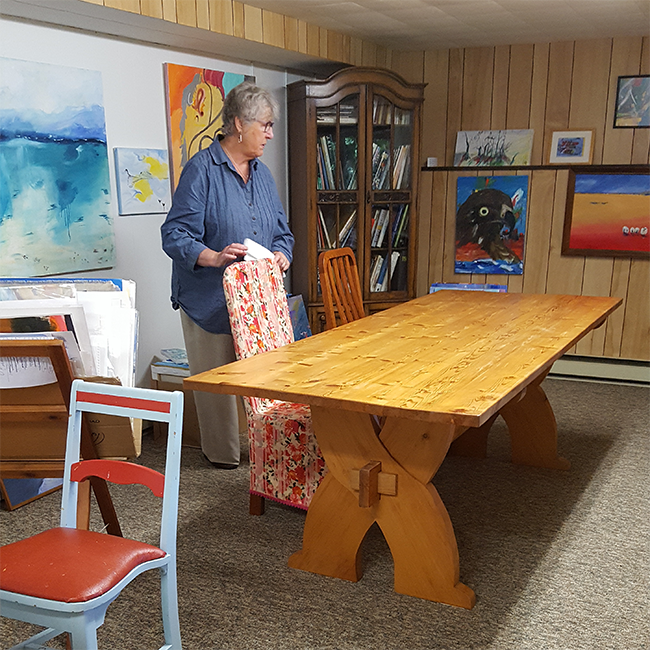 We were sad to say goodbye to our trestle table handcrafted by my hubs, but happy it would stay in the family and be put to use in Sea to Canvas studio by Ursula mom! These are the kinds of decisions you will be faced with when you embrace living in a smaller footprint home. Letting this meaningful piece go meant we had to find a replacement table that would be a good fit. We enjoy meals with friends, so our new table had to be expandable for our lifestyle yet fit into a condo size space. We were also wanting a classic Mid Century piece. That’s been our dream. I scoured the UsedVictoria ads every.single.day. hoping for a teak set to come our way! They don’t come up that often, at least not when you start to align budget, dimensions, condition, location and then of course answering the ad fast enough for even the slimmest shot at being first in the queue. 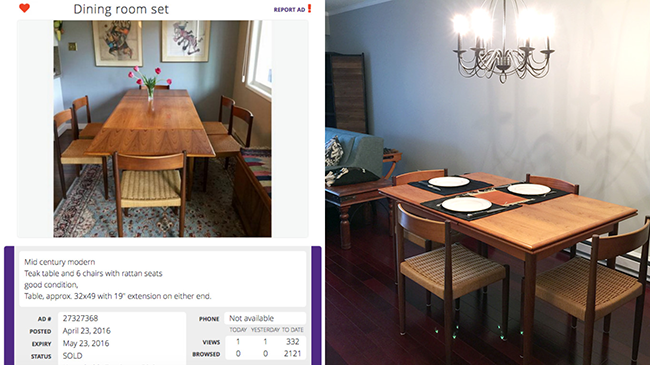 Yes, Mid Century tables go fast! So knowing all this, we were thrilled when money changed hands and WE got to wrestle this 1960s Danish Modern set into our new home! Don’t let the small profile fool you – teak is solid hardwood heavy and this table was no slouch in making us work for her! Wait, what? We really did go through our things and yes we really did let stuff go! Where did the zen of our small space go? Ugh. So at this point we are now fully moved in. ‘All’ our stuff we opted to keep is here. And yes, we are literally boxed in. No, seriously. We ARE boxed in! Honestly, if you think downsizing is a cinch, I say you better cinch twice and then cinch again! I hope you will pop back to check up on our progress. In the meantime, I’m off to list a few more things to sell, compile yet another load for the thrifts, and send out an SOS to family that if you need ‘it’ we probably have one or two! 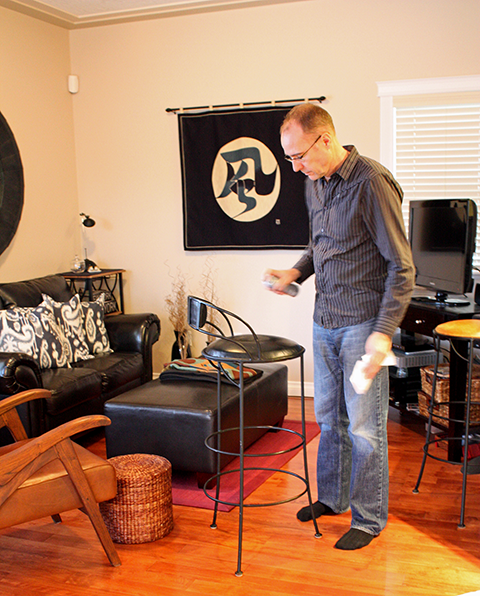 If you’ve lived the downsizing move, what did you do? Please share your tips and strategies, because trust me, others need to know! You might remember, in August I sourced this Mid Century glass top coffee table from Used Victoria. I wrote about the downsizing story behind it here. 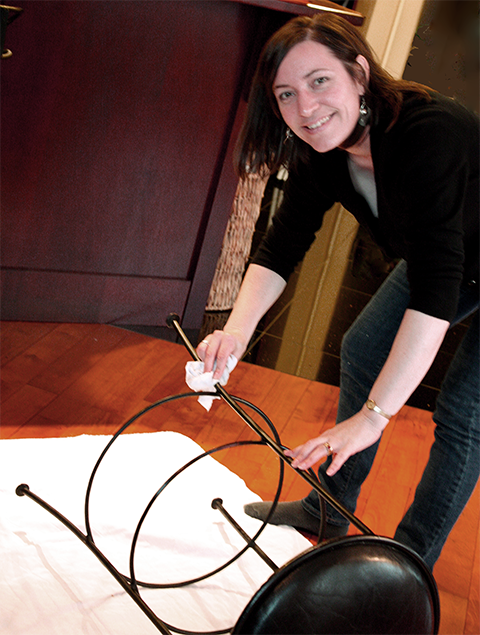 My original plan was to paint this little table black – another display prop for Audrey Would! This turned into a re-staining project instead. I’ve never really tackled staining anything on my own and will admit I was a bit nervous. From what I’ve read I know I should have stripped the old stain off first, but there were some pretty deep water stains to overcome so I went straight to sanding. If you want a great tutorial with some biodegradable product options for stripping old stain, check out my friend Shauna’s post here. 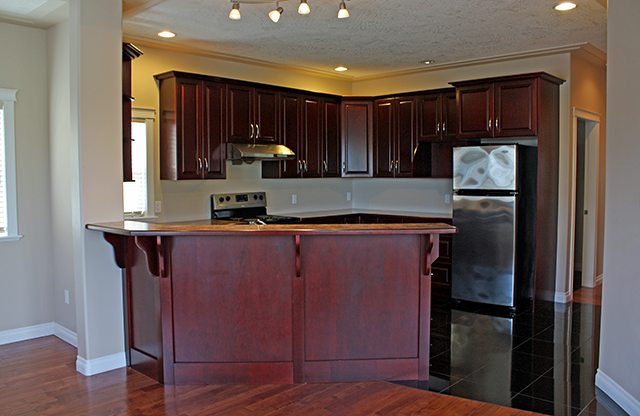 After wiping away the sanding dust I applied Minwax® Water Based Pre-Stain Wood Conditioner with a foam brush. This conditioner penetrates the wood to help ensure an even stain, and I chose to use this because of the pre-existing water stains. Because I wasn’t 100% sure of the wood (I think it’s Mahogany), and I wanted to reinforce the table’s Mid Century Modern roots, I chose Minwax ‘Gunstock 231’ for the stain colour. 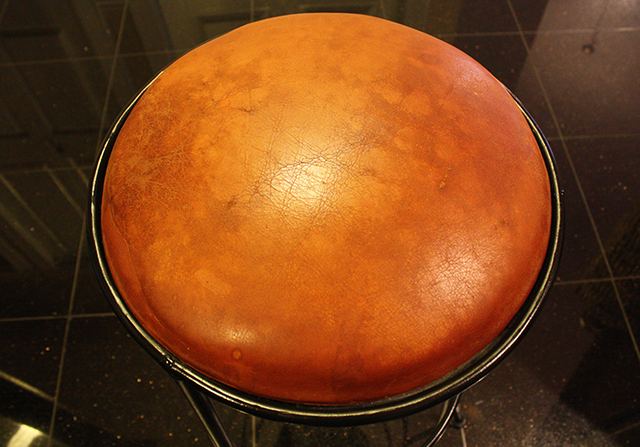 This stain has the orangey-red teak feel without being too strong in either direction. I also applied the stain with a foam brush and then wiped it away with a lint-free cloth. I am so glad I used the conditioner first as the wood really soaked the stain up. Here you can see the stain applied to the shelf, legs and end pieces. The side pieces hadn’t yet been stained, and yes, I panicked at the bright orange of the shelf at first! Without the conditioner it would have been really hard to apply the stain evenly on this shelf. 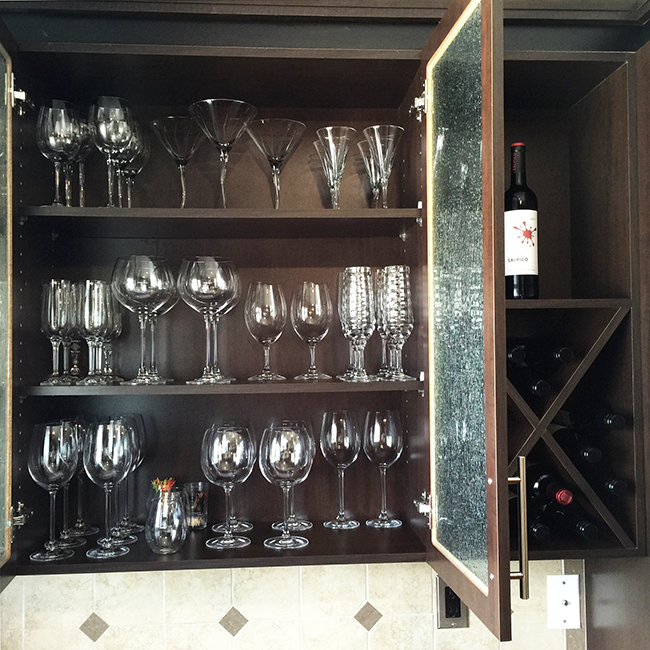 The darker sections you see in the shelf are actually the wood itself, not uneven stain. This shelf was really tricky to work with and I had to give some spots more layers of stain than others to get it looking even. I think the legs are maybe a different type of wood than the rest of the table, because the grain of them is more porous and they took the stain to a darker colour than the rest. The shelf took the longest to dry of all the areas, but it also had more layers of stain applied than the rest. In the end I left the table alone for 2 days to fully dry before moving it into place. I almost left this project too close to the wire. You see, we hosted a cocktail party on Saturday night and I wanted the table ready in time, which it was but with no days to spare! In the end I’m happy with how this table came out – it isn’t actually as orange as it looks here. What I feel good about is having honoured the roots of this little piece rather than painting it my go-to black. How about you? Have you stained anything like this, and if you have what are your tips? What do you use for a finish? 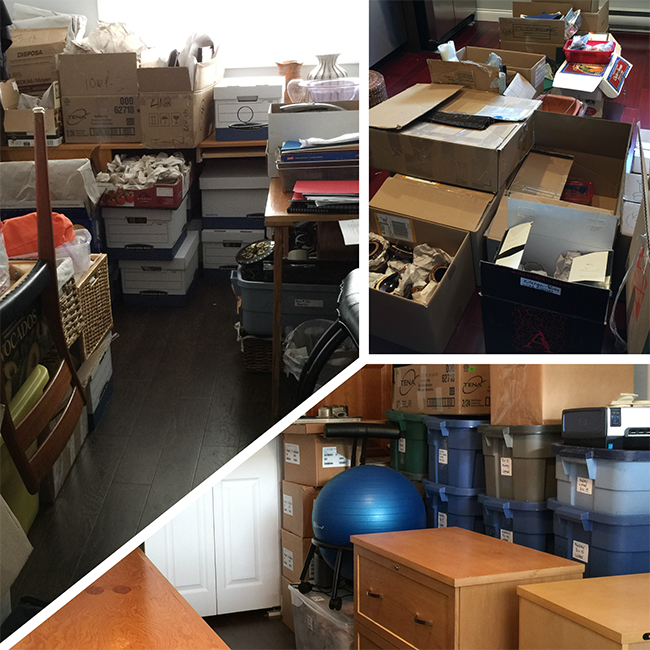 A ‘Used Victoria’ Buy Made Me Pause and Reflect… Downsizing. What’s It All About? As September kicks into high gear and the Victoria Vintage Expo draws near I have been shifting my focus to this year’s booth presentation. This has me clicking through the Used Victoria ads for potential DIY options. And so I picked up this table… it caught my eye because of its lines and glass top. It’s made of mahogany, and was crafted over 40 years ago. My initial thought when I answered the ad was for a quick makeover, most likely my usual go-to black spray paint, maybe turquoise, gold or white, to become an Audrey Would! prop… and then I met the owner. If you’ve followed my blog over the years you will know how much the stories behind the pieces mean to me, and with this piece I inadvertently tripped upon a story about the journey of ‘life’. You might want to sit with a cup of tea for this read. An elderly gentleman answered my knock. Well, actually it was after I twice rang the doorbell and then looked for another door just in case. He apologized for not hearing the doorbell, said he and his wife didn’t hear so well anymore. He invited me in, and the home was clearly in the throes of being undone. I asked if he was moving, and “yes’ was his reply. We made our way to this little table, which he showed to me with pride. I asked how old it was, and it was in this moment that I knew the little table was more than just a piece being moved on. The gentleman told me his son made the table in high school, and his son is now 58. He reflected that he thought his son had done a good job – the table was very solid and in good shape, you know. Then he shared how he and his wife have taken very good care of it over the years… all 40-plus years of its life… he said they kept plants on it and used doilies to protect it, and that they were very careful when they watered the plants not to get water on the wood… He said they had cleaned the glass, but I would probably have to clean it again. I promised him I would take very good care of the table, that I would give it a good home. And so… for now I will not be painting this table black or turquoise or white. I will not be adapting it for an Audrey prop at this year’s Vintage Expo. I will be giving it a light sanding and a fresh staining that brings out the mahogany red, and my Mr. and I have decided that we will be giving it pride of place in our home. Some things are meant to just be. **UPDATE** The table has now been re-stained. Click here to see it pride-of-place in our home. Photograph courtesy of Used Victoria ad. 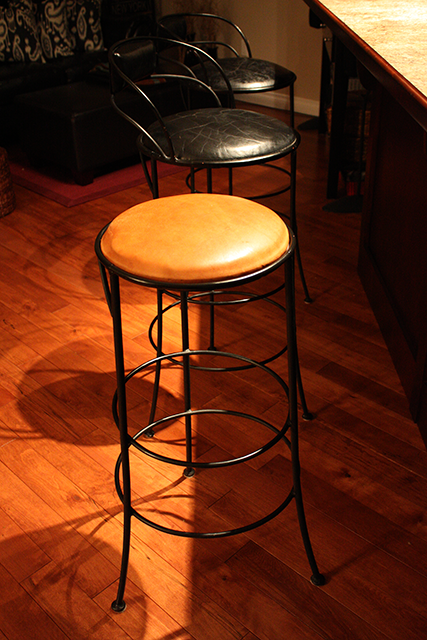 Fab Bar Stools For Us! 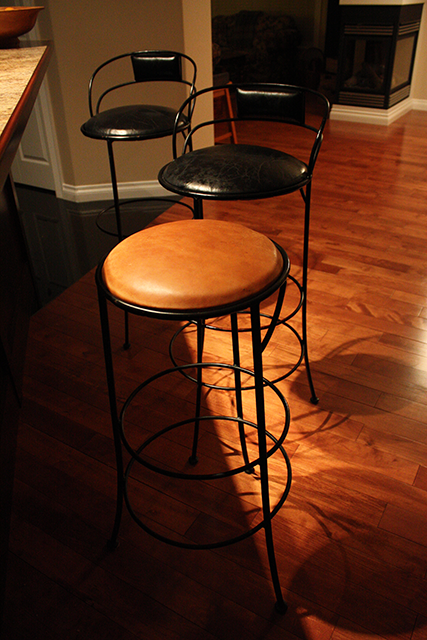 Ever since we moved into this home we have been keeping bar stools in the back of our mind. We have a breakfast bar, but without stools. So it’s really just been a feature that allows us to prepare dinner and still be part of the conversation beyond the kitchen prep area. Do you remember this VERY early ‘Before’ photo? Yes, this would be prior to any moving in taking place! But I got over it! 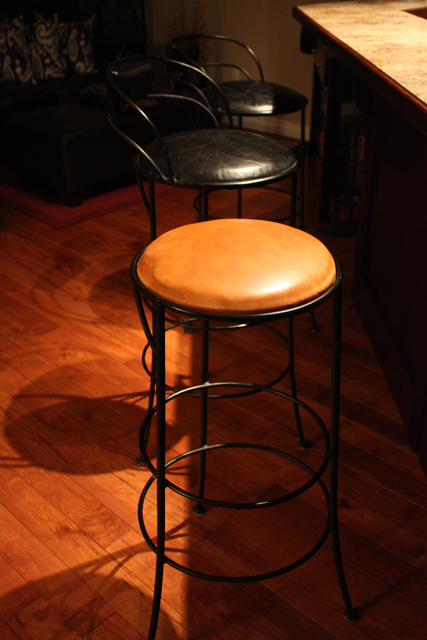 We even stopped thinking about bar stools for a while. Until last week when I started poking around Used Victoria, Used Cowichan, etc. And then, there they were! 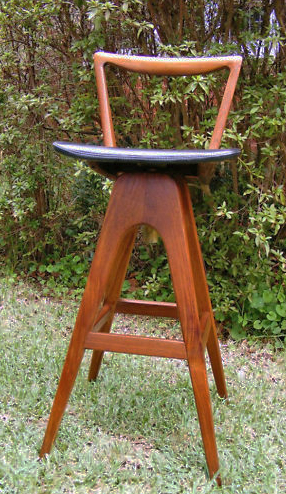 3 Mid-Century Modern stools at an awesome price. But the ad was dated back to October. On spec, we decided to follow through anyway. And they were available! So we set off to Victoria on our bar stool adventure to check them out. I’ll cut to the chase, and just say that we bought them. I had the camera with me, but didn’t take any pictures until we got home… you know how it goes! And used a leather cleaner on the seats. And then a leather conditioner after that. And after the conditioner, but before it was fully absorbed in. This really shows you how much the leather needed it! We’re just happy the seats are leather, and we wont’ stop conditioning them any time soon. 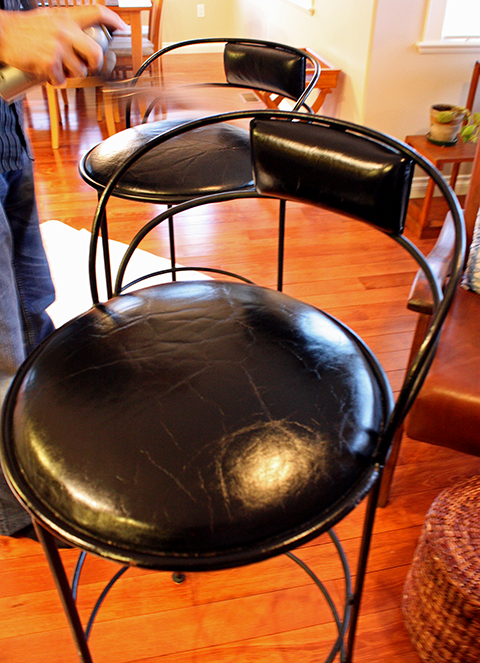 So as it turns out, there was apparently a lot of interest in the stools, but they are higher than normal standard, and wouldn’t fit under most breakfast bars. Not a problem for the height of our bar! And once you’re sitting in them, they’re actually the perfect height. We gave them a test run that very night! 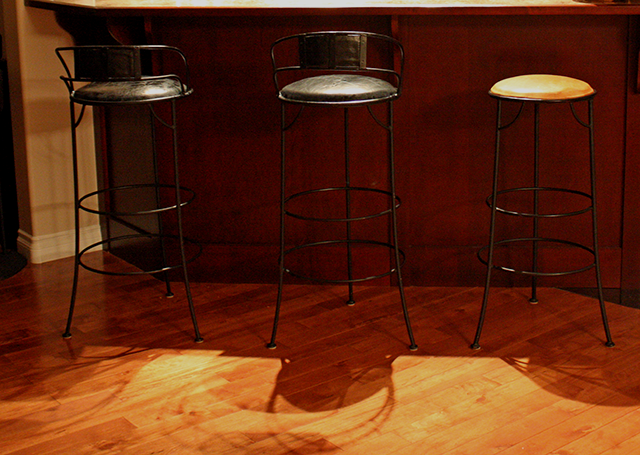 Did you notice there are only 3 legs, not 4 on each stool? And how about the double hoops? 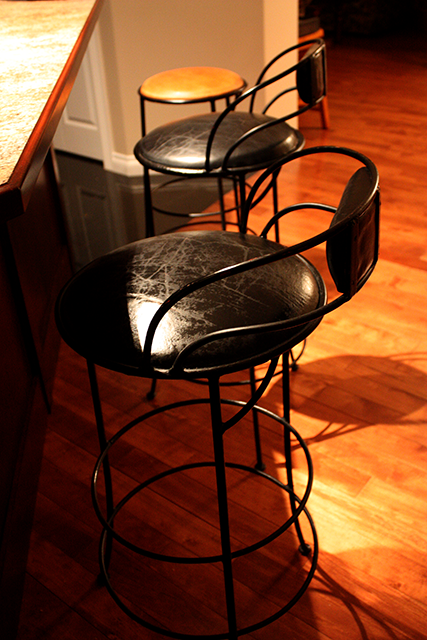 Most stools will have 4 legs and a single hoop footrest, if there’s a hoop at all. We’re loving the lines of these pieces, and the extra details. Can I just say we’re pretty excited? 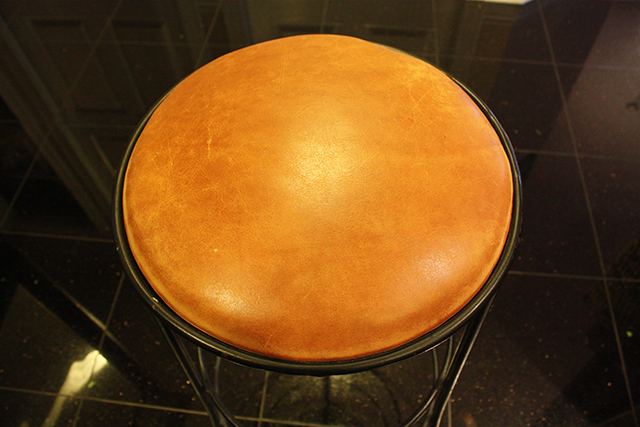 And I really want to give a shout out to Andrew, the person we bought the stools from. He was awesome. Super knowledgeable, and gave us a heads-up on a few different Mid-Century Modern auction opportunities. He also told us about the Modern Eye: Craft and Design in Canada exhibition at the Art Gallery of Greater Victoria… but the details on that are saved for another day! 😉 Oh, if you’re interested in seeing this exhibition , the last day is this Sunday, November 27th. Have you found any great deals lately? Are you looking for anything special? Where do you like to go searching??? 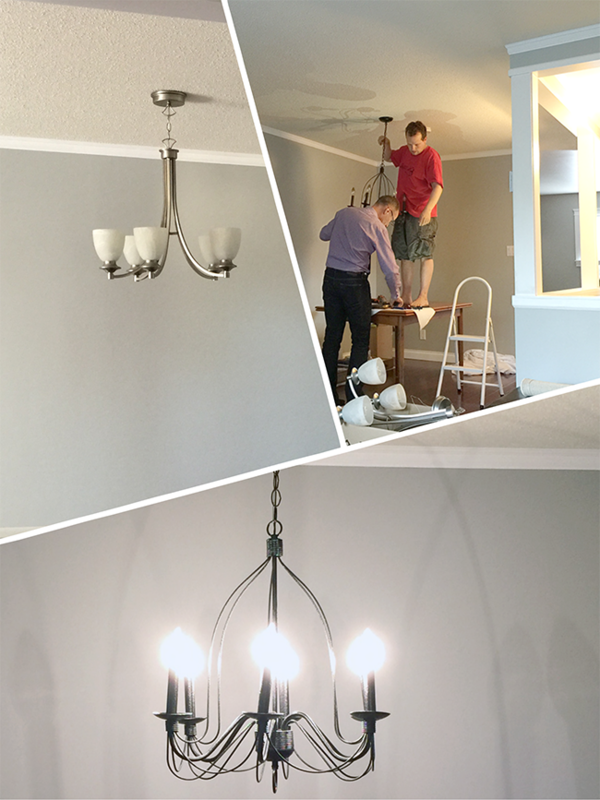 It’s about coming home… If you want a remarkable space that tells your story, contact me to see how we can help!